A surprise Pompey start for Chaplin against Luton? In most seasons, clubs would relish the opportunity to start the campaign against one of the newly-promoted clubs. Yet, in Pompey's case, it's quite the opposite. Luton may be one of League One's new boys, but they're quietly fancied to deliver back-to-back promotions. The bookmakers have the Hatters as general fifth favourites for the title – one place behind the Blues in the betting. Nathan Jones has established a squad swelled with players who are capable of performing in the third tier. The fact that summer signing Sonny Bradley is likely to start on the bench against his former emloyers speaks volumes. It was Luton who dumped Pompey out of the FA Cup last season at Kenilworth Road. That day they already looked like an established League One outfit. 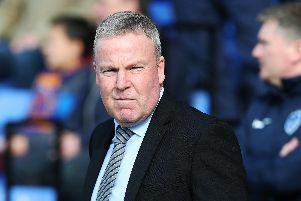 It's a difficult start to the campaign for Kenny Jackett's side, no doubt, but a victory against a potential promotion rival would give them crucial early-season momentum. Pompey head into their curtain-raiser without arguably their chief attacking threat. Jamal Lowe will be forced to watch the Luton clash from the Fratton Park stands frustrated he's not out on the pitch. An ankle injury he picked up against FC Utrecht has sidelined him for the first few weeks of the season. It's no doubt a huge blow for the Blues. They will have to face the Hatters without last season's top assist-maker. Regardless, they have an able deputy in Gareth Evans to function down the right flank. The popular midfielder has pace to burn when he gets going and is one of Pompey's best crossers of the ball. A SURPRISE CHANCE FOR CHAPLIN? Kenny Jackett admitted on Thursday that Conor Chaplin wants a fresh start away from Fratton Park. However, that doesn’t mean the Pompey boss won’t utilise the striker against Luton. It’s likely Jackett will continue with the 4-4-2 formation he's used during pre-season. But Jamal Lowe’s absence means the Blues are a flair player short out wide. Gareth Evans and Brandon Haunstrup, who has operated in a left-midfield role of late, may slightly lack that trick or piece of skill to get past the opposing full-back in tight situations. Jackett may not want two similar wingers operating down both flanks. As a result, he may opt to switch Ronan Curtis from his striking role to the left wing. That leaves a void in who partners Brett Pitman at the top of Pompey’s attack. When Pitman and Oli Hawkins have partnered each other, there has been a severe dearth of pace. Therefore, it could be Chaplin who is selected to join his captain up front.